The members of the Mormon Church gain a greater understanding of God by reading the Book of Abraham. This is based on three different Egyptian facsimiles on different papyri that Joseph Smith translated. 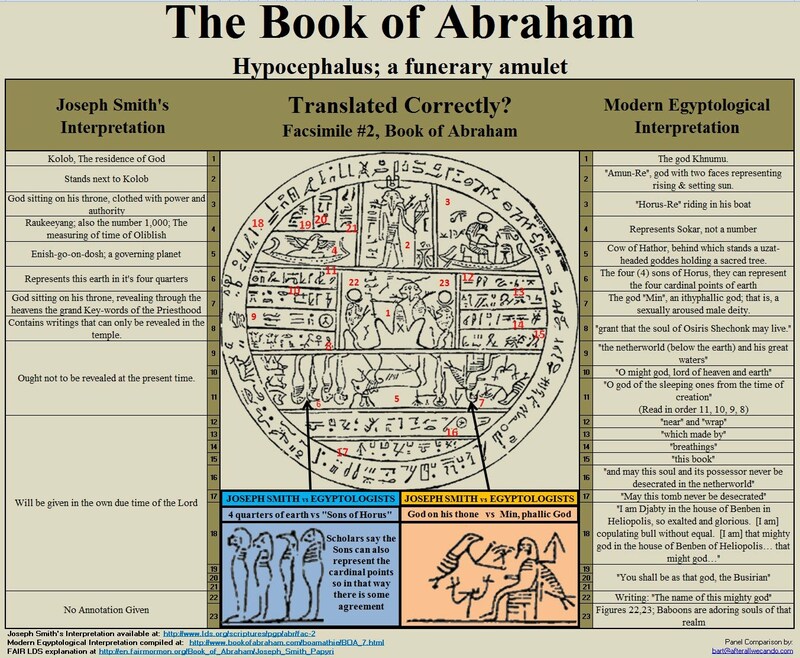 On the official lds.org website it says states that the Book of Abraham was “translated from the Papyrus, by Joseph Smith.” This notation is above each of the different papyrus or facsimiles. Today, we will focus on Facsimile 2. Based on this image, Joseph learned that Kolob is the place of residence for God (Fig 1). There is even this person standing next to Kolob (Fig 2). He saw “God sitting on his throne, clothed with power and authority” (Fig 3). While on that throne, God revealed the “grand key-words of the Priesthood” (Fig 7). There was even a word, meaning 1,000, that measured time ((Fig 4). It was found that Enish-go-on-dosh, was a governing planet (Fig 5). The four figures were the four corners of this earth (Fig 6). A part of this image could not be deciphered by Joseph, at the time (Fig 9-23). One specific part of the image was, however, to be revealed in the temple (Fig 8). If this was all true then it would surely give more insight on God and his priesthood power. However, this Facsimile was later translated by Egyptologists and found to be a totally different translation then what Joseph Smith thought. Fig. 1. Kolob, The residence of God. Fig. 2. Stands next to Kolob. Fig. 3. God sitting on his throne, clothed with power and authority. Fig. 4. Raukeeyang, also the number 1,000; The measuring of time of Oliblish. Fig. 5. Enish-go-on-dosh, a governing planet. Fig. 6. Represents this earth in it’s four quarters. Fig. 7. God sitting on his throne, revealing through the heavens the grand key-words of the Priesthood. Fig. 8. Contains writings that can only be revealed in the temple. Fig. 9-11. Ought not to be revealed at the present time. Fig. 12-21. Will be given in the own due time of the Lord. Fig. 22-23. No Annotation Given. Because of the fact that a man, acting as a prophet of God, translated these papyri, we really need to do some research to see if the translation holds water. Fortunately, 27 Modern Egyptologists have seen it and translated it according to the lds.org essay, “Translation and Historicity of the Book of Abraham“. Let us get right into the Modern Egyptological Interpretation of Facsimile 1. Figure 1 is the god Khnumu. Figure 2 is “Amun-Re”, god with two faces representing rising & setting sun.” Figure 3 is “”Horus-Re” riding in his boat.” Figure 4 is “Reresents Sokar, not a number.” Figure 5 is the “Cow of Hathor, behind which stands a uzat-headed goddess holding a sacred tree.” Figure 6 are the “The four (4) sons of Horus.” Figure 7 is “The god “Min” an ilthyphallic god; that is, a sexually aroused male deity.” Figure 8 says “grant that the soul of Osiris Shechonk may live.” Figure 9 is “the netherworld (below the earth) and his great waters”. The rest of the figures were also translated. What do we learn here? We learn that Joseph Smith’s Translation was wrong. None of the things that Joseph mentioned was found in the translation. The correct translation has to do with the book of the dead, as well as the book of breathings. This was used to depict the dead, that after they are buried, go on to the netherworld. Fig. 1. The god Khnumu. Fig. 2. “Amun-Re”, god with two faces representing rising & setting sun. Fig. 3. “Horus-Re” riding in his boat. Fig. 4. “Reresents Sokar, not a number. Fig. 5. Cow of Hathor, behind which stands a uzat-headed goddess holding a sacred tree. Fig. 6. The four (4) sons of Horus, they can represent the four cardinal points of earth. Fig. 7. The god “Min” an ilthyphallic god; that is, a sexually aroused male deity. Fig. 9. “the netherworld (below the earth) and his great waters”. Fig. 11. “O god of the sleeping ones from the time of creation” (Read in order 11, 10, 9, 8). Fig. 12. “near” and “wrap”. Fig. 13. “which made by”. Fig. 16. “and may this soul and its possessor never be desecrated in the netherworld”. Fig. 17. “May this tomb never be desecrated”. Fig. 19-21. “You shall be as that god, Busirian”. Fig. 22. “Writing: The name of this mighty god”. Fig. 23. “Figures 22,23; Baboons are adoring souls of that realm. Oh Lord, I am so grateful to come to the knowledge of Your truth. Thank You for showing me the way. Thank You for giving me the desire to seek out what is true and what is false. If You had never instilled this desire in my heart, I would never have gotten the enlightenment You’ve given me concerning Joseph Smith and the Mormon Church. My desire to learn from You has helped me see through the teachings of Joseph and properly see what is false. You have confirmed to my heart that he is a false prophet and cannot be trusted. His translation of the Book of Abraham is a great representation of this and I am so grateful that You have given me over to this understanding. For so long my heart was far from You and I could never learn. Thank You for taking my brokenness and humbling me, that I may learn. I would not be where I am today if You had not come into my life. You have changed the way I think and act. I am born again in Your love. Thank You Lord. I love You. Amen.